This is Bill's and my favorite salad! It has so many interesting and complimentary flavors. I use a really nice aged balsamic vinegar to garnish this salad. Since it's been aged for 20+ years it's more of a sweet syrup then a normal balsamic vinegar. I bought mine from a fantastic Oil & Vinegar store in Santa Barbara called Il Fustino. Place sliced onion in medium bowl. Cover with cold water; let stand 30 minutes. Drain well. Place 1/3 cup dressing in another medium bowl. Add apples; toss to coat. Trim off tips of romaine halves, leaving 5-inch lengths. 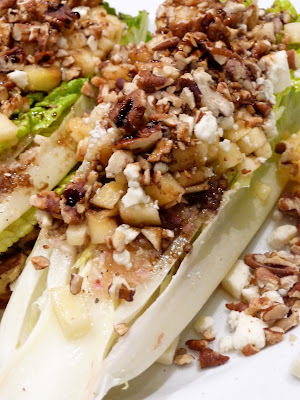 Cut each romaine half lengthwise into 2 wedges. Fan wedges on large platter. Top with red onion slices. Drizzle salad with dressing, then sprinkle with apples, pecans, gorgonzola cheese and garnish with balsamic vinegar.